The booklet is geared to licensed petroleum mechanics and experienced petroleum contracting professionals to use as a quick reference guide, and its recommendations have been established to meet, and in most cases exceed, all provincial and/or federal regulations. In addition, it contains a glossary of commonly used industry terms. 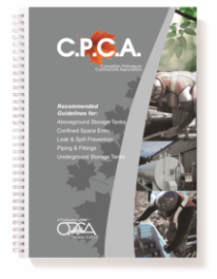 The full-colour, diagram and photo-heavy handbook is meant as a reference, not a text-book, and offers step-by-step instructions on how to tackle tasks like verifying recommended slope for excavations, ensuring the proper storage tank handling, and executing pressure testing methods and tank purging methods.